Plaza de España was built for the Universal Exposition of 1929 and since then has been one of the main landmarks in Barcelona, around which many of the most important attractions and venues can be found. it's also well connected, featuring several metro lines, train lines, and bus lines (including the Aerobus from Barcelona airport). 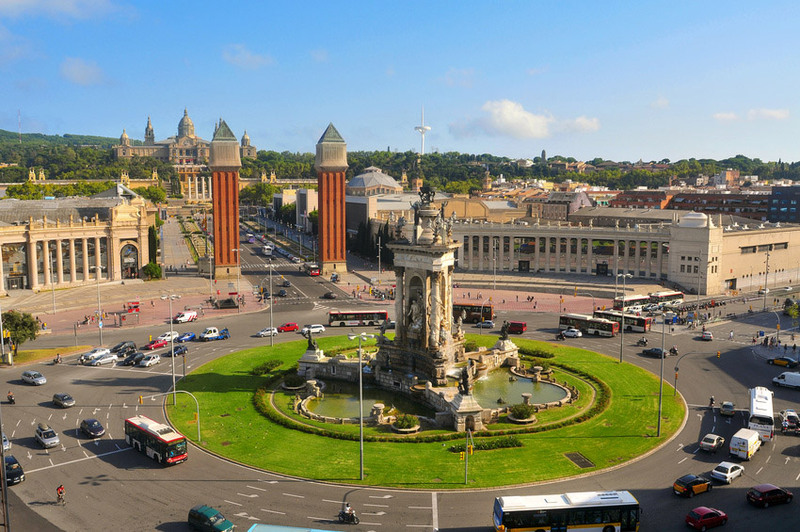 It is the largest square in Barcelona an the second largest in Spain after the square of the same name in Madrid. The project to build Plaza de España was laid out by Josep Amargós in 1915. Eventually the Catalan architects Josep Puig i Cadafalch and Guillem Busquets took on the responsibility of completing the plans. The dictator Primo de Rivera came to office and they were removed from the project due to their political ideas. In the end, it was Antoni Darder i Marsa who completed the project in 1926, the square was named "Plaça d’Espanya" to emphasize the Spain rather than Catalonia. Several hotels were built around the square to accommodation attendees of the Universal Exposition, though none remain except one building that is now a public school, and the Municipal Institute of Education. What can you find around the square? There is a fountain with large baroque columns right in the centre of the plaza. This work was created by Josep Maria Jujol and is influenced by Saint Peter's Square at the Vatican. It is a symbolic work that represents the importance of the sea and rivers in Spain, as well as religious, heroic, and artistic symbology. The Venetian Towers by Plaza de España are inspired by Saint Mark's Campanile in Venice. They are the work of Ramon Reventós and mark the entrance to Avenida Maria Cristina. It's still a hub for expositions. It is home to one of the building of the Fira de Barcelona buildings, which hosts some of the most important expositions and conventions in Europe.. The Las Arenas Shopping Centre, used to be a disused bullfighting ring, but it has been remodeled into a shopping centre, with top brands, restaurants, and a cinema. It opened to the public in 2011. The main entrance to Montjüic is made through Avenida Maria Cristina. So what do you think about Plaza de España? Leave us a comment.